What’s the most precious thing ? Money ? No, it’s Time. The more time you can save, the better your life gets. If you run out of time, things start to go out of control. Well, maybe I am going too serious with this but I can ensure you that this particular web application that I have found will save a lot of time of yours, if you love reading blogs and of course news around the world. So, what’s so special about SoundGecko ? You simply listen to the article instead of wasting your time reading it with just a click. The article is sent to the server and is available to you within seconds. So who reads out the article ? It’s similar to the popular text-to-speech application Talk It ! where you would write words and hear it. Those who are born after the year 1995 may not know of this application because it came with the Microsoft Plus package in Windows 95. Before proceeding, do not expect the man reading the article out to be a real man reading it with emotion. Initially, you might find it weird but eventually you will get used to it. It actually depends on how the sentences in the articles are constructed. If the article is written well, the ‘man’ will be reading it out in a good tone. Go to Soundgecko and register. The MP3 file that will be transcribed will be sent to the email address you provide. If you use Google Chrome to browse the net, install the extension and the job gets done in seconds. After placing the small icon beside the address bar, choose an article you want to submit by remaining on that site. The article will be sent for transcription and will arrive in your inbox depending on the article length. That’s it ! Simple as that ! So for example, you love reading blogs but at the same time you want to browse Facebook too. You want to read this great article you found regarding the recent Google penguin updates.Simply open the blog article and click the small Soundgecko button and you will be listening to the article and also browse Facebook at the same time. The best part is when you receive the link to your article and they give you an estimate of the time you have saved by not reading it. You also have the option to download the MP3, share it with your friends through Facebook/ Twitter and if you don’t like what you are hearing, the option to read it is also available. Now, there are times when you might face problems. Nothing so serious but the ‘man’ might be reading out stuff that you do not want to hear. 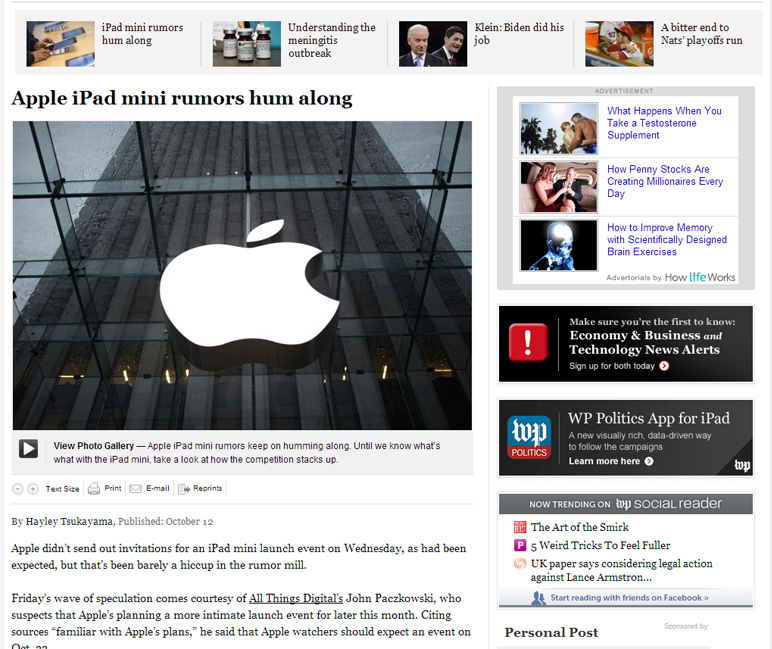 Take for example, an article in Washington Post regarding the Apple iPad Mini Rumors. You can see there are other article links on the top, side, ads here and there etc. You really do not want to hear those in the middle of the article. To make things easier, all these popular blogs (also in the normal ones ! ) have an option of ‘Printing’. Simply, click the print button and you will be redirected to a page where only the article will be available. An example is shown below. As stated above, just click the button to send it ! Hope you like this app as much as I liked it. This app is available in iTunes Store and available for Windows Phone. The Android version, according to the site, will be coming soon. This app is perfect for those who are browsing from their smartphones or their tablets. It does become a hassle when you read the article in your device as the font size is sometimes low. The only disadvantage of this app, which sometimes you might feel, would be the monotonous tone of the ‘man’. Oh well, its better than having nothing ! As long as it saves time its great. Share your thoughts on this app ! I’ve tried a couple extensions that read out the article. Can’t quite get used to the robotic voice. Some sites such as searchengineland closes down popup windows, or iframes, whatever they’re called. So SoundGecko didn’t work there. But it’s pretty cool and works great most of the time. I have been visiting so many blog who uses mp3 to read there article. In these case, they have the access to attract readers who doesn’t want to read a very long article. That’s a good addition ! Maybe I should add it in my blog too ! Can’t wait for the time that you are able to put mp3 audio in your blog. This looks like a fantastic application, especially for the visually impaired. I just hope they don’t run into copyright issues. Amazon had a fight with publishers about its text to speech on Kindle devices. I’m a big fan of audiobooks so I will have to try this app. Thanks for letting us know about it! Oh my, you just reminded me of that issue ! Let’s just hope Soundgecko doesn’t fall into such hassle ! You did mention a good point about this being a good app for the visually impaired !